You probably know the iconic “Rosie the Riveter” poster: a woman in a kerchief and work shirt, with bulging bicep and determined expression, and the words “WE CAN DO IT.” This image (which originally wasn’t even called Rosie the Riveter) was embraced by the feminist movement in the 1980s and has become an emblem of women’s competence, strength, and combative spirit. So much so, that it’s now something of a cliché. If you want to show your kids the history behind that image, an excellent place to start is the Rosie the Riveter / World War II Home Front National Historical Park in Richmond, California. The park is a short drive north of Oakland and Berkeley just off I-580, and we stumbled upon it during a recent vacation in the Bay Area. It’s not a national park in the ordinary sense — the Park Service doesn’t even own any of the land. Instead, there’s a Rosie the Riveter Memorial, a visitor center, a Liberty ship (the SS Red Oak Victory), and a few other sites in and around Richmond’s historic shipyard and industrial area. The park is very new: the visitor center only opened last May, and several of the sites aren’t open to the public yet. Even so, it’s well worth a visit. We spent about an hour in the visitor center and hope to come back eventually to see more of the park. The visitor center is in a handsomely renovated industrial complex that includes the former Ford assembly plant, which turned out jeeps, tanks, and halftracks during World War II. At the center, we saw a short documentary film, toured several rooms of displays (photos, reproduced war posters, models, and a few original artifacts), and visited a small gift shop. You can find the iconic Rosie image here, but it’s not emphasized. There are too many other engaging sights and sounds presenting a rich combination of stories. Many of the stories are about the women and people of color who were able to move into industrial jobs during the war. Several of the display panels as well as the film we saw feature interviews with diverse women and men who lived in Richmond and worked in its factories and shipyards. You learn how women workers faced discrimination and harassment but earned respect on the job. (By some accounts, women became better shipyard welders than the men.) How African Americans launched the national “Double-V” campaign, which stood for victory over fascism abroad and racism at home. How workers of every ethnicity and gender endured severe overcrowding but also saw their achievements celebrated with every ship launched. Alongside all the history, there is also a display devoted to Rosie’s Girls, a summer camp program in several states, where middle school age girls learn skilled trades such as welding and carpentry (also bike repair, electrical wiring, fire fighting, etc.) as part of developing their own strength and confidence. The National Park Service is one of many partners sponsoring Rosie’s Girls. 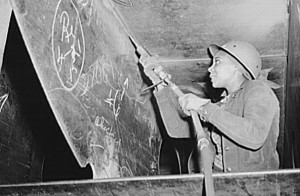 Miss Eastine Cowner helps construct the Liberty ship SS George Washington Carver, Kaiser shipyards, Richmond, CA, 1943. FSA-OWI Collection, Library of Congress Prints & Photographs Division, LC-USW3- 028673-C.
Because there are so many story threads at the Rosie the Riveter visitor center, there are opportunities to engage kids of many different ages and interests. Our 9-year-old paid close attention to a lot of the military-themed posters, as I expected he would. But when I asked him what he liked best at the visitor center, he said the film, and the display about the Port Chicago “mutiny” (strike), when black sailors refused to load munitions under unsafe conditions, after an explosion at the docks killed 320. Fifty of the “mutineers” were court-martialed and sent to prison. The Good War myth glosses over the uglier side of how the U.S. fought World War II at home and abroad, from the mass imprisonment of Japanese Americans to the suppression of workplace activism, from the treatment of Japanese soldiers as subhumans to the refusal to rescue Europe’s Jews. Fortunately, Rosie the Riveter visitor center largely presents home front history free of sugar coating. It doesn’t shy away from portraying the persistent discrimination that workers of color faced. 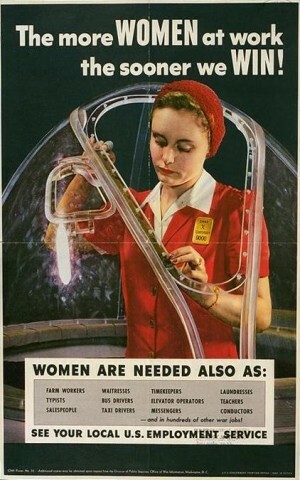 And it makes clear that recruiting women into industrial jobs was never intended to shake up gender roles permanently, and that most of these jobs were closed to women again once the war ended. Overall, this is a valuable and promising example of public history. I look forward to seeing the Rosie the Riveter / World War II Home Front National Historical Park continue to grow and develop in the years ahead. This National Park Service online exhibit of artifacts, photos, and stories does a good job of presenting complex history in a clear and accessible manner. This video from the Library of Congress is narrated by women’s studies specialist Sheridan Harvey. Her analysis of Norman Rockwell’s “Rosie the Riveter” cover of the Saturday Evening Post is a highlight. The Regional Oral History Office of UC Berkeley’s Bancroft Library has interviewed dozens of Bay Area residents about their World War II experiences. Excerpts from some of these interviews are available online. This 2007 blog post on Bay Radical, a blog devoted to the history of radical activism in the Bay Area, describes the memorial and includes a good summary and links about World War II industry in Richmond CA and elsewhere. Sue Davenport’s film review in Jump Cut (April 1983) asks how women workers’ individual experiences relate to larger historical forces. This is Chapter 4 of Wanda Downing Jones’s 1988 masters thesis at the University of Texas – Arlington, which focuses on women workers’ relationship with organized labor during World War II.